This writing series, focusing on 9 to 12 year olds, hopes to ignite and kindle a passion for books and writing within each participant. 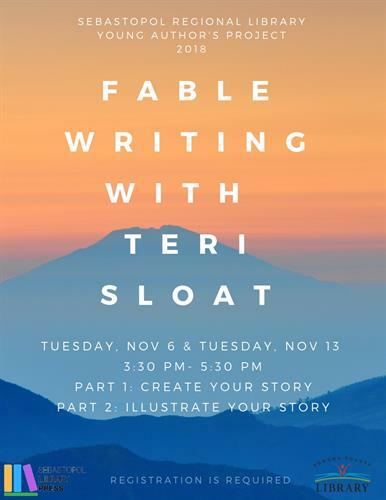 Join local author, Teri Sloat, as she shares her writing process and leads the class in writing a fable and making an illustration. Upon completion of the fables and illustrations, Sebastopol Regional Library will compile the work and publish it as a multi-author book that will be housed at the library. Each participant will also be given a copy to take home. This is a two part series. This second workshop focuses on the process of editing and illustration. Walk-ins will still be welcome if there is space to accommodate them. Registrants arriving later than five (5) minutes after program start time may forfeit their spot depending on space availability.